I'm thinking about buying a chest pack/rig. Curious if you've used one, what you've used, and what you reckon of it. 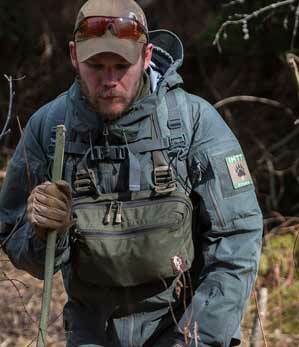 A friend of mine uses the Hill People Chest rig, which looks pretty badass. I wear binos on my chest and that's all. Everything else fits nicely in my pack or day pack. I find the less restriction you have on your upper body in challenging going the better. Especially scrambling over rocks or through thick scrub. mikee, Sideshow, hotsoup and 1 others like this. Agreed, just the above. Would hate to have a bulky bag on my chest. Chest rig worked OK as part of a heavy pack on my back; it improved my balance. But if I went down it was never fun getting up lol. Even a bino bivvy can imped an off hand shot. Not ideal for tight bush stalking imo. Been musing the same thoughts, both the Alaskan one and the Hill people one seem to be made by people in areas without thick Bush, however I can see the sense of having a few small thinks at hand without having to take a pack off to get at them. I could see how one of those with the binoculars and a range finder could be handy, just not sure if it would be awkward prone trying to take a shot with something sticking in my chest. Will watch this thread to see how you go!